How Can DNA Repair Defects Be Exploited to Develop Novel Treatments? 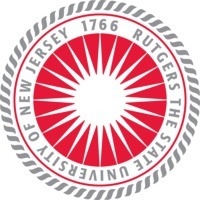 Your contributions will help support Dr. Shridar Ganesan’s interdisciplinary team at Rutgers University as they identify gene alterations to seek effective, personalized treatments for breast cancer patients. Donations will help fund the $400-500K required to support personnel, specific cell and animal models, and analysis of patient tumor samples. Help understand cancer etiology and create more precise therapies by funding Dr. Ganesan’s research! Researchers now know that cancer is not one disease based solely on anatomy, but a collection of very distinct diseases. For example, two different women may be diagnosed with breast cancer, but each one may be quite different in its natural history and response to different treatments. Similarly, two cancers that arose in different parts of the body but with similar genomic changes may respond to similar treatments. Dr. Shridar Ganesan, Associate Professor of Medicine and Associate Director of Translational Science at Rutgers Cancer Institute of New Jersey, aims to identify the specific genomics changes present in a given cancer in order to both understand how this cancer arose in that patient, and to craft specific treatments. In so doing, Dr. Ganesan and his laboratory hope to ultimately develop highly individualized therapies that may combine standard chemotherapy, targeted therapy, and even immunotherapy that specifically target the biological features of each individual cancer. A main part of Dr. Ganesan’s laboratory focuses on understanding how defects in DNA repair genes, such as the breast cancer genes BRCA1 and BRCA2, can lead to specific vulnerability to certain chemotherapy agents and the new PARP inhibitors. The team has also developed a molecular tumor board, where they discuss difficult cases of cancer using clinical-grade tumor sequencing assays, to find new treatment approaches for patients with rare or refractory cancer types. 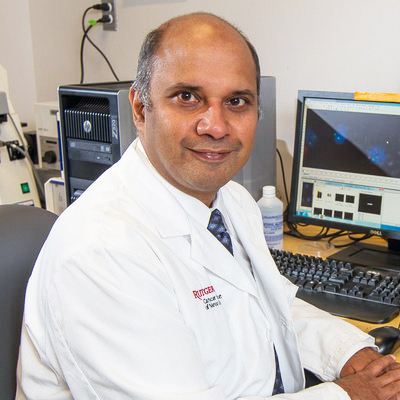 A translational researcher who both probes basic science and sees patients, Dr. Ganesan collaborates with his team of computational scientists, basic scientists, and laboratory experimentalists as well as cancer centers in New Jersey and worldwide, hoping to derive effective treatment solutions that will help increase patients’ response rate. Identifying Defects in DNA Repair: Dr. Ganesan and his team are trying to identify how defects in DNA repair that are present in cancers including hereditary breast and ovarian cancer make cancers vulnerable to certain DNA damaging agents. Currently, classic chemotherapy works well only in some patients, but identifying which patients will benefit and which will not has been challenging. Recent evidence suggests that standard chemotherapy, which works by inducing damage to DNA, works best in tumors who have underlying defects in the abilities to repair specific kinds of DNA damage. Ultimately, Dr. Ganesan hopes to identify these defects in individual cancers, to be able be able to identify which kinds of chemotherapy may be most beneficial and to craft individualized treatments. Identifying Novel Genomics Alterations, Especially Translocations: Just as a typo renders the original content different, the “text” of the DNA changes when one letter is different. Current technology effectively allows researchers to identify these single letter typos and similar changes in the DNA using sequencing techniques. However, the problem worsens when the entire paragraph is blocked out or all the words are the same but they are in reverse order. Such “cutting and pasting of genomic text”, also known as genomic rearrangements, can lead to significant changes for the cell, but would not be easily found by standard “spell check” sequencing approaches. Therefore, Dr. Ganesan and his team are developing novel methods of identifying genomic rearrangements that they feel are the main drivers of abnormal growth in some cancers. Characterizing Novel Alterations: While performing genomic sequencing in the clinic, the team has found many novel alterations that have never before been seen, and are working to take these novel alterations and characterize them in the lab. By characterizing how novel DNA alterations affect cell growth and survival, Dr. Ganesan’s team hopes to understand if the presence of this alteration functions as a driver of cancer growth and if it makes them vulnerable to certain treatments. Dr. Shridar Ganesan’s early research experience as an undergraduate with Professor Herchel Rabitz in Chemical Physics made him realize he wanted primary research to be part of his future career. He enrolled in a joint M.D.-Ph.D. program at Yale University and quickly was captivated by the beauty, complexity and power of cell and molecular biology. His clinical experience as a resident led him to oncology: the patients were wonderful but treatments were so limited and toxic. One of his first patients, a young woman with breast cancer, particularly made a lasting impression on him. She had come in very sick, but had a dramatic response to a treatment where the tumor practically melted away and she left the hospital remarkably improved. However, this effect was only temporary and within a year the disease came back, became resistant to the treatment, and ultimately led to her death. Such shocking and heartbreaking experience had Dr. Ganesan dedicating his career to better understanding the biology of cancer and helping to develop improved treatments. Dr. Ganesan came to The Cancer Institute of New Jersey in 2005 from the Dana-Farber Cancer Institute/Harvard Medical School where he was an instructor in medicine and staff physician. He started my medical training at Yale University, where he graduated from with both an M.D. and a Ph.D. in cell biology. He then completed a medical residency at the Brigham and Women’s Hospital in Boston and served as a Chief Medical Resident. This was followed by a fellowship in medical oncology at the Dana-Farber Cancer Institute. With a research interest in breast cancer biology and DNA repair, Dr. Ganesan is currently exploring how DNA repair defects in cancers can be exploited to develop novel effective treatments. He is also active in applying next-generation sequencing technology to identify specific genomic changes in cancers that can be therapeutically targeted. As a physician and scientist, he both runs a basic research laboratory focused on breast cancer biology and sees patients in the Stacy Goldstein Breast Cancer Center. In the clinic, he works collaboratively with experts across multi-disciplines and has the opportunity to put theory into practice as his team aims to develop the next generation of targeted treatments for breast cancer. Working with a team of radiation oncologists, surgical oncologists, nurses, social workers, genetic specialists, and others, Dr. Ganesan helps patients understand their specific disease and their treatment options so that they can make informed decisions. He is also an associate professor of medicine and pharmacology at Robert Wood Johnson Medical School, and the author or co-author of more than 40 publications, serving on the editorial board of the journal Frontiers in Molecular and Cellular Oncology. PCT/US2010/022891: "Image Analysis Based Recurrence Prediction of ER+ Breast Cancers"
2009, Basanvanhally A, Ganesan S, and Madabhushi A.